Along with 70 other environmental advocates, journalists, scientists, and other concerned citizens, Dana Al Hammadi is en route to Antarctica on an awareness-raising mission. Dana Al Hammadi is an inspiration to women everywhere. Thirty-seven years old and a mother to five children, she has embarked on one of the most important trips of her lifetime – to Antarctica. But this is no joy ride. Inspired by Tamer Hassein’s similar expedition last year, the environmental activist from Abu Dhabi intends to bear witness to Antarctica’s stark climate change. After returning later this month, she intends to share her knowledge and passion with students and adults throught the UAE with a view towards generating greater environmental awareness. On March 1 this year, Al Hammadi flew from Abu Dhabi to Buenos Aires and then to on to Ushuaia – the southern-most city in the world. There she met up with 70 other expedition members, a diverse group consisting of business leaders, students, journalists and teachers. After a brief stay there, the group took off on their two-day and 900 nautical mile journey towards Antarctic and by yesterday morning, the group had already traveled half way through Drake’s passage. Al Hammadi received her first glimpse of the effects of climate change during her quick trip to Argentina, where the Martial Glacier in Tierra del Fuego has shrunk dramatically in the last several years. The group will experience more of the same in Antarctica. All is not doom and gloom, since the journey does have significant, positive overtones. Al Hammadi told Gulf Daily that while she was somewhat nervous, the prospect of traveling to Antarctica excites her. She also described the necessary preparations. As well as becoming physically fit over the past four months, Al Hammadi – accustomed to the UAE’s lavishly warm temepratures – had to purchase special gear for the extreme cold. Temperatures, with wind chill, can drop to -30 degrees celsius. I have big plans when I come back. I am scheduled to give presentations and lectures in schools, colleges and among the business community on my experience. I want to raise awareness among my Emirati brothers and sisters on the importance of protecting the environment, climate change and renewable energy. I want to inspire more Emiratis and residents next year to go on such challenging trips, so that, when they come back, they can further spread the word. In order to be able to enjoy this fabulous opportunity, Al Hammadi was required to raise her own funds. Eitsalat and Masdar were among her generous sponsors. Will Libya’s Unrest Trash The Country’s Historical Sites? Next Next post: Were Tesla’s Solar Innovations “Buried” by Big Oil? Thanks N. Our apologies, and congratulations to Noor. We took our information from Gulf Today – hopefully they have also been informed? 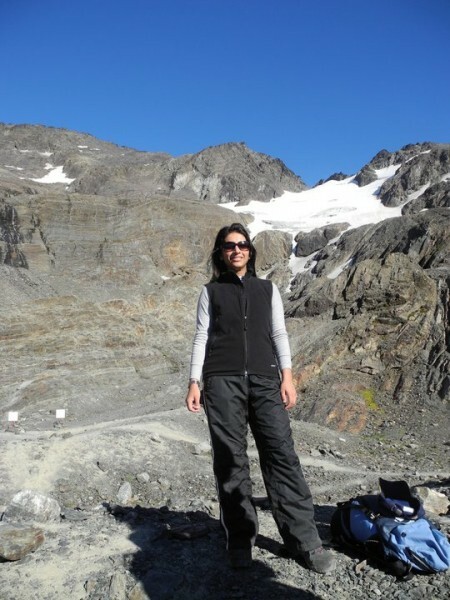 Noor AlFalasi was the first emirati to go to antarctica in 2007-2008.